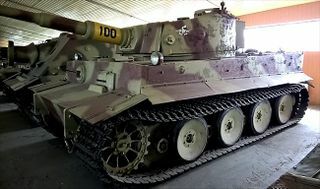 The Tiger I is a German tier 7 heavy tank. 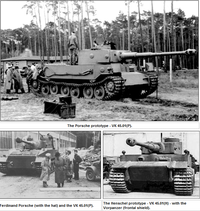 Development of the Tiger I was started in 1937 by the Henschel company. Mass production began in 1942, with an eventual total of 1,354 vehicles manufactured. 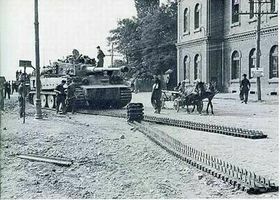 The tank first saw combat in the fighting for Leningrad, and Tigers were at the forefront of battles from Tunisia to Kursk. 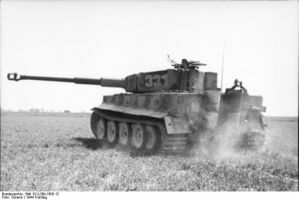 Although production was discontinued in the summer of 1944, the Tiger I continued to see action until the end of the war. This was the first German heavy tank in WWII and proved itself to be extremely formidable against the Allied forces, composed primarily of M4 Shermans and T-34s. In the game you'll face much higher tier opponents. This tank was designed as a medium to long range sniper. Keep that in mind and make use of its great rate of fire and renowned German-engineered accuracy. Spot your enemy, avoid close combat, and keep your gun at work by firing the moment you reload. Snipe the enemy and support your team. 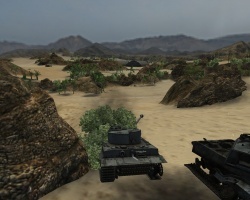 The Tiger I leads to the Tiger II. Flat, somewhat thin armor wont bounce much shots unless angled well. Many German tanks are great snipers, and the Tiger is no exception. 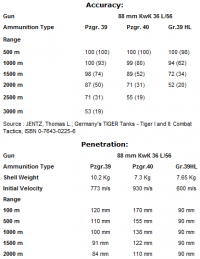 Its top gun, the 8.8 cm KwK 43 L/71, is extremely accurate (0.34), inflicts good damage, has a phenomenal rate of fire and has excellent penetration, enough to go through any Tier 9's weak spots. If you are at the bottom of the list, let your allies spot the enemies for you to snipe. Stay at a distance, using bushes if possible, and with your superior accuracy and armor penetration you'll soon whittle them down. However, it's still best to equip Optics (or even Binocs since this tank often stays stationary in thick bushes, like a sniper would) in case you don't have allies to spot for you, as the base view range is quite good for its tier. This gun is formidable even in the tier 8 arena, and will have no problem penetrating most tier 8 heavies from the front. 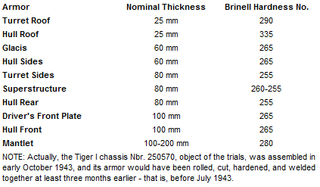 The armour though does not hold up to its historical value because the direct competitors of this tank were designed to counter the tiger (IS, T29, etc.). If you find yourself at the front in close proximity to enemy heavies that are the same or higher tier than you you have done something wrong. The armour of this tank just will not save you. While you can side scrape you are completely vulnerable when you take a shot because you have to expose the flat front of the turret to bring the gun to bear; even when side scraping only the hull will bounce. 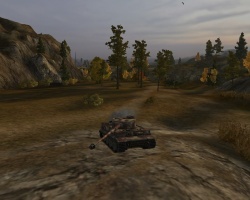 If enemy tanks like a hulldown t29 catch you at medium range you are screwed; you will be spotted when you fire and the enemy will go through your armour like a hot knife through butter. While you might be able to snipe weak spots they just have to be able to hit you to do damage and at medium to close range that is not hard. The armour of this tank really is bad. The IS for example has 20mm more armour at the front for bother the hull and turret AND the IS has sloped/rounded armour. Artillery eats tigers up for breakfast. Tigers are big, have thin unsloped armour, and large health pools to farm damage from. 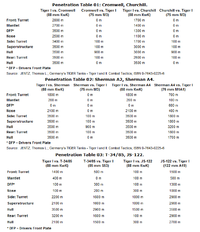 Although the Tiger has some of the best and most reliable DPM values for a Tier VII tank, the armor is weak and boxy, even when angled, a handful of tanks, such as the T29, can penetrate the Tiger with relative ease. New players will be in for quite a surprise when even some tier V tanks damage them. 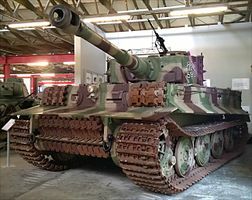 While it's good to be aggressive in a game, a destroyed tank is of no use to anybody and this is especially true for the Tiger, for as long as it's kept alive, it will deal incredible amounts of damage. The good news is that the Tiger has a tough turret frontally for when you can get hull-down, and the side armor is decent for sidescraping. Even if it is at the top of the tier, caution is still advised for tanks such as the KV-1 have enough penetration or have HE guns to pose a sufficient threat against your thin, boxy armor. However, don't be afraid to take a few shots later on in the game; your Hit Point is best in tier and will enable to you to switch positions as well as give you an opportunity to play your DPM against the enemy when possible. In short - this tank is a complete gem to players who like a cautious, supportive play style, and should be played as such. 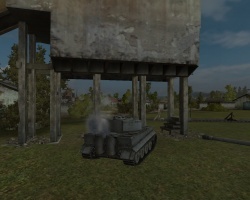 However, many players run through this tank to get to the Tiger II without proper knowledge and experience, and these players tend to give this tank a bad reputation. Make no mistake, the Tiger (H) is a formidable tank once the player works out the unique style of the tank. The 8.8 cm KwK 36 L/56 cannon and the radios carry over from VK 36.01 (H). You can equip the 8,8 cm L/56 immediately for better DPM or stick with the 7,5 cm L/70 for its higher penetration. But you will have a hard time hitting anything. Research the upgraded suspension for more weight capacity and traverse speed. Next research the "Pz.Kpfw. 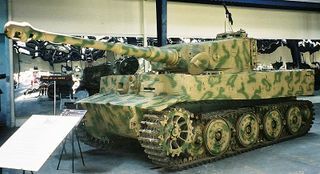 Tiger Ausf. E" turret and then the 8,8cm KwK 43 L/71 cannon. You might want to hold off on equipping the second turret until you have the cannon researched, since the turret traverse drops by quite a bit. The cannon is what makes it worth it. It is necessary to excel with this tank. Research the engine "Maybach HL 230 TRM P45" for a noticeable boost in horsepower. There will be a striking boost in acceleration. 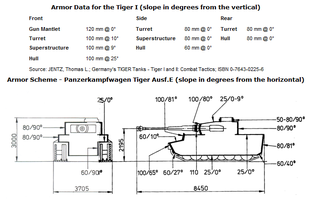 The Tiger I was proposed arm the stronger 8,8 cm Kw.K. 43 L/71. However, there were certain factors that stopped this proposal from being carried out. 1. The turret would need a counter weight fitted as well as a weight on the breech of the gun. 2. Ammunition storage would require nearly a full rebuild of the ammunition storage racks, it would also make the forward racks unaccessible by the loader reducing the amount of ready storage without rotating the turret 90 degrees to access it. 3. Handling of the ammunition in the turret was impossible using the original Tiger turret. The length of the shell from where the breech sat in the turret the shell was longer than the entry of the breech to the turret aft. (Basically, the shell couldn't go into the breech due to how close the breech sat near the aft of the turret. 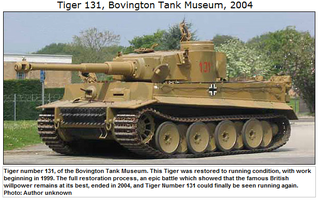 In addition, the construction of the Tiger II made this proposal redundant. Proposal of mounting the 8,8 cm Kw.K. 43 L/71, from the book "Der Panzerkampfwagen Tiger und seine Abarten"
Reconstructed Tiger I at the German Tank Museum, made up of various parts of Tiger tanks found at the Trun scrapyard in Normandy. 1) The Pz.Kpfw. VI H Ausf. 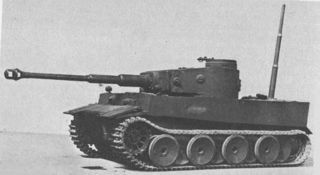 H2 turret was only meant for the VK 36.01 (H), which is the Tiger I prototype. The turret would need a counter weight fitted as well as a weight on the breech of the gun. 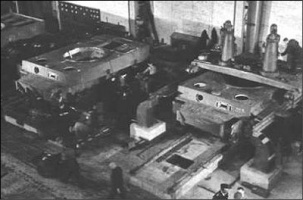 Ammunition storage would require nearly a full rebuild of the ammunition storage racks, it would also make the forward racks inaccessible by the loader reducing the amount of ready storage without rotating the turret 90 degrees to access it. 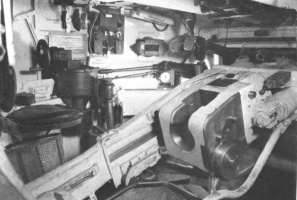 Handling of the ammunition in the turret was impossible using the original Tiger turret. The length of the shell from where the breech sat in the turret was longer than the entry of the breech to the turret aft. (Basically, the shell could not go into the breech due to how close the breech sat near the aft of the turret. 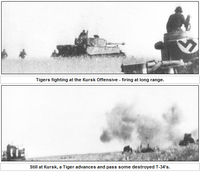 Therefore the KwK 43 configuration on the Tiger as depicted in-game is fictitious. It would require a new turret and a rework of the hull, hence why the project was never done. 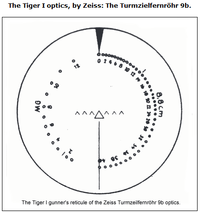 The turret ring was large enough to handle the recoil, but the above problems basically make it impossible to just put the gun into a Tiger's turret. This page was last modified on 9 April 2019, at 13:02. This page has been accessed 86,949 times.